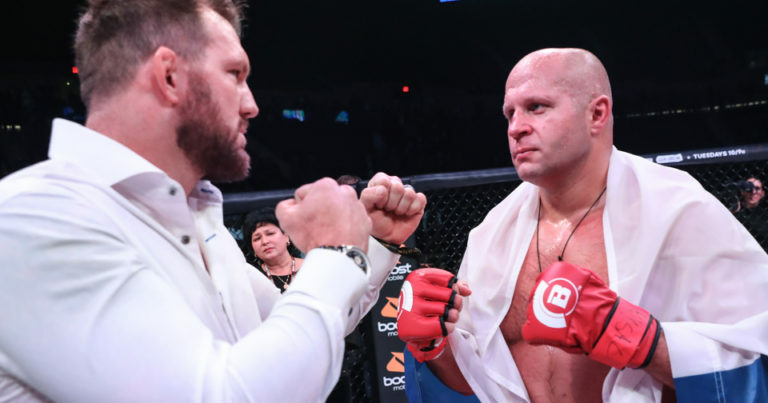 Saturday, January 26th the Championship finals of the Bellator Heavyweight Grand Prix comes to a head with Light Heavyweight Champ Ryan Bader taking on all-time great Fedor Emelianenko. The Russian-legend and former NCAA Division 1 Wrestler have battled their way through the open two rounds of competition. Bader defeated King Mo and Matt Mitrione and Fedor got the better of former UFC Heavyweight champion Frank Mir and Chael Sonnen. 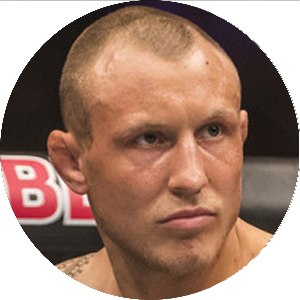 This tournament will ultimately end the Heavyweight championship hibernation that last saw former champion Vitaly Minakov defend the title against Cheick Kongo at Bellator 115 back in 2014. Minakov won the strap from one fight earlier from Alexander Volkov, but eventually stepped away from the promotion after his first title defence and was stripped of the title. 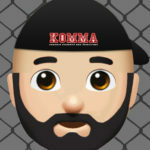 On the strength of an impressive 8-0 run fighting in Russia, the undefeated former Champion will return to Bellator to once again fight Cheick Kongo in early February 2019 at Bellator 216. It is hard to argue against a future title shot shout Vitaly emerge victoriously. Bader enters the contest has the sizeable favourite at -300 while the return on Emelianenko currently sits at +270. Most sites have Bader ranging from -300 to as high as -335. Based on recent performance, I felt Bader would come in closer to the -400 range, but the aura of “The Last Emperor” could be influencing the line. Additionally, Bader is more suited to compete at Light Heavyweight, but the same could be said for Fedor had he made that decision earlier in his career. In fact, Bader will stand a full 2 inches taller than his adversary, but Fedor will have a 2″ reach advantage and hit the scales roughly 5-10 pounds heavier than “Darth”. How does the underdog emerge with a win on Saturday night? Simple, he needs to knock Bader out. 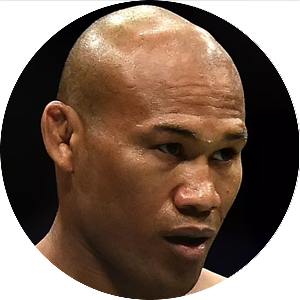 While Ryan is 6-fights and nearly 3 years removed from his last knockout defeat, he has still been stopped on 3 occasions and hurt multiple times as well. Fedor’s willingness to move forward and unleash face-melting power punches his both his key to success and most likely his path to defeat. If Fedor can successfully engage Bader and draw him into a striking contest he could finish him. Conversely, Emelianenko’s often wide punches and over-aggression leaves him open to the wrestling and counter level change of the Light Heavyweight champion. If Fedor can’t score the finish in the early stages of the fight and he hits the floor with Bader on top, he will be in for a long night. Bader has a couple of avenues to victory here. Fedor’s vaunted durability isn’t what it used to be. Fabio Maldonado nearly finished him and we have seen him staggered on multiple occasions, including his knockout loss suffered against Matt Mitrione. Bader has power and should be the quicker and more technically sound fighter. Yet, trading on the feet with his foe does leave open the potential for a Bader knockout loss. With Bader adopting a more strategically oriented approach to fighting, look for him to implement his wrestling. Against Mitrione, he took the bigger man down and exhausted him on the mat for the duration of the contest. That being said, Fedor’s Sambo skills and all around grappling experience makes controlling him on the floor a much more daunting task than the former Football player presented. Ultimately, Bader should find success utilizing his jab at distance before closing the gap to shoot on Fedor and take him down. Still, it is hard to overlook the potential that the Pride legend could crack Bader during an early exchange and finally capture a North American-based championship title. Bader has more tools and a larger window for victory. While the American would love to add a standing finish of Fedor to his resume, he plays it safe and leans on his wrestling. Once the impact of his combined takedowns and ground and pound take effect, Fedor will slow down, offering less resistance to the wrestling and the threat of a knockout will diminish. I strongly believe that Fedor will either retire and return to Russia regardless of the outcome. At 42 years of age, the undersized Heavyweight has little to offer at this stage of his career. If he wins the fight, defending the title and risking a defeat to end his career is unappealing and would be a mistake. As previously mentioned, it would be hard to overlook Vitaly Minakov as a future title challenger and that is a fighter Fedor would and should not take. If Bader becomes a 2-division champion, the Minakov fight certainly seems a like an interesting and promotable option. The former undefeated champion taking on the holder of two Bellator titles. That is a great fight for the fighters and the promotion. Bader has the potential to cement himself as one of the best Light Heavyweights of all-time. He is far removed from his defeat at the hands of Jon Jones and while he has suffered other defeats throughout his career, he has also compiled an impressive list of victims. If down the road, Bader were to consider a return engagement with the UFC, his continued success in Bellator would position himself for a big-money title fight opportunity with the man who handed him his first career loss.